NASA's space shuttle Endeavour stands poised to launch on its final mission STS-134, its 25th and last mission before retirement. Liftoff is set for May 16, 2011 from Pad 39A at the Kennedy Space Center in Florida. This story was updated at 11:36 p.m. EDT. 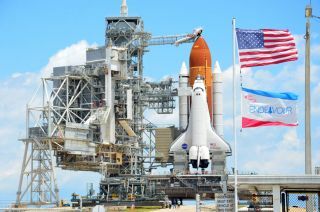 CAPE CANAVERAL, Fla. — NASA has begun fueling the space shuttle Endeavour for one last liftoff Monday morning (May 16). Endeavour is scheduled to blast off from Launch Pad 39A here at NASA's Kennedy Space Center at 8:56 a.m. EDT (1256 GMT). Weather forecasters predict a 70 percent chance of good launch conditions. Workers began the three-hour process of loading the shuttle's giant orange external fuel tank with super-chilled liquid oxygen and liquid hydrogen propellants at 11:35 p.m. EDT Sunday (0335 GMT Monday). This will be the second launch try for Endeavour's STS-134 mission, after a broken set of heaters thwarted an attempt on April 29. "The space shuttle program, I think, will definitely be remembered for the amazing things that it has done," said mission specialist Michael Fincke in a NASA interview. "Everything that we’ve learned along the way, all the technology, all of the science that we’ve been able to bring in in these past years with the space shuttle, I think, is going to be remembered very nicely in the history books." For Endeavour's mission, commander Mark Kelly will lead a seasoned crew of six on a 16-day trip to the International Space Station. Kelly and Fincke's fellow astronauts include pilot Gregory H. Johnson and mission specialists Greg Chamitoff, Andrew Feustel, and European Space Agency astronaut Roberto Vittori. "We’re taking up a very important experiment, the Alpha Magnetic Spectrometer, a science experiment that could change the course of physics," Johnson said in a NASA interview. "It's one of those rare kinds of experiments, that it really might just open some new doors that we never even knew existed." The astronauts plan four busy spacewalks during the mission to install the new supplies and do maintenance on the exterior of the orbiting outpost. Endeavour was originally scheduled to blast off April 29, but NASA called off the countdown because of two failed heaters designed to prevent a critical power unit from freezing on orbit. Without functioning heaters, the orbiter's hydraulic systems would have been at risk, officials said. Engineers worked around the clock to troubleshoot the issue. Ultimately, NASA traced the problem back to a broken switchbox feeding power to the heaters. Workers removed the box and replaced it, and about 20 feet of wiring leading to and from it, with new hardware. Tests have shown the issue to be resolved. NASA is expecting large crowds to come out to Florida's Space Coast for the final launch of its youngest orbiter. Around 500,000 spectators are expected, somewhat less than the roughly 750,000 who turned out for the first launch attempt. NASA officials said the drop was due to the fact that Monday morning is not quite as attractive a time as Friday afternoon for some launch viewers. President Obama was also on hand for Endeavour's last try at liftoff. When the shuttle didn't launch after all, the president and his family took a tour of the NASA facility. Obama has not announced any plans to come again for take two. Another high-profile guest will be in attendance, though: Commander Kelly's wife, Congresswoman Gabrielle Giffords, is expected to travel from Houston to Florida to see her husband launch. Giffords has not been seen in public often since she survived a mass shooting in Tucson in January. She has reportedly made great strides in recovering from a bullet wound to the head, and is expected to watch the shuttle lift off with the other astronauts' family members.